The data come from a number of matches from the 2015/16 PlusLiga (Polish League). A brief summary is given below. There are more matches for some teams than others, but all teams are represented by at least 17 matches. Note: we believe that many of these are mistakes in the scouting files, so the actual number may well be lower than this. For sets 1–4, there are technical timeouts at 8 and 16 points, which correspond to the dips in the upper panel. Coaches will typically avoid using a team timeout when a technical timeout is imminent. These dips aside, there is a general increase in the number of timeouts called as the set progresses, peaking around 20 points. Set 5 (during which there are no technical timeouts) shows a peak around 3–4 points, a second around 10 points, and possibly a third around 13 points. There is a particular hotspot when the opposing team’s score is around 5 and the calling team’s score is lower — so the opposition has jumped out to a quick start. It is clear that most timeouts generally lie above the 1:1 dashed line, meaning that the opposing team is ahead of the calling team. 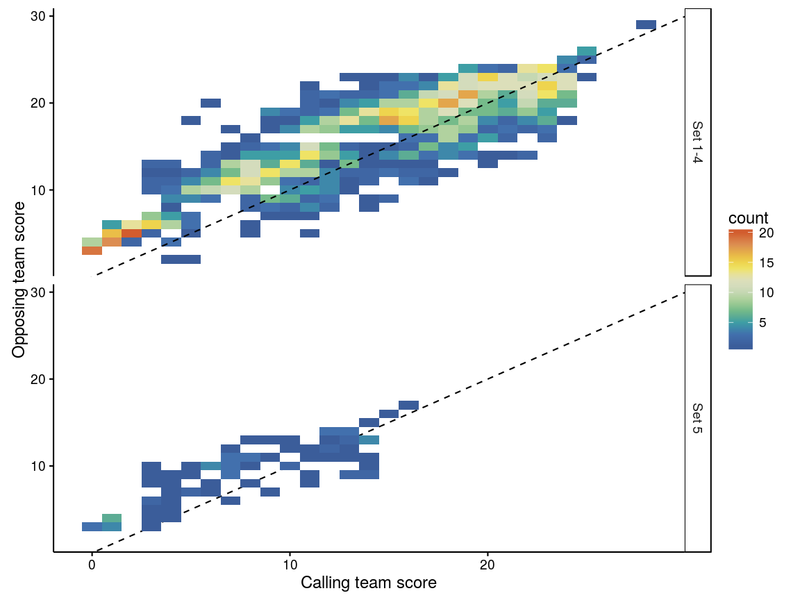 There are also a number of timeouts called when the calling team is ahead of the opposition, mostly towards the end of the set: possibly these might correspond to situations where the opposing team has scored a run of points and is catching up to the calling team, but this wasn’t looked at further here. Only a small proportion (about one quarter) of timeouts were called by a team that was leading at the time. Thus, the serve error rate during general play appears to be higher than in other situations. Nothing consistent here, and the result is not significant. 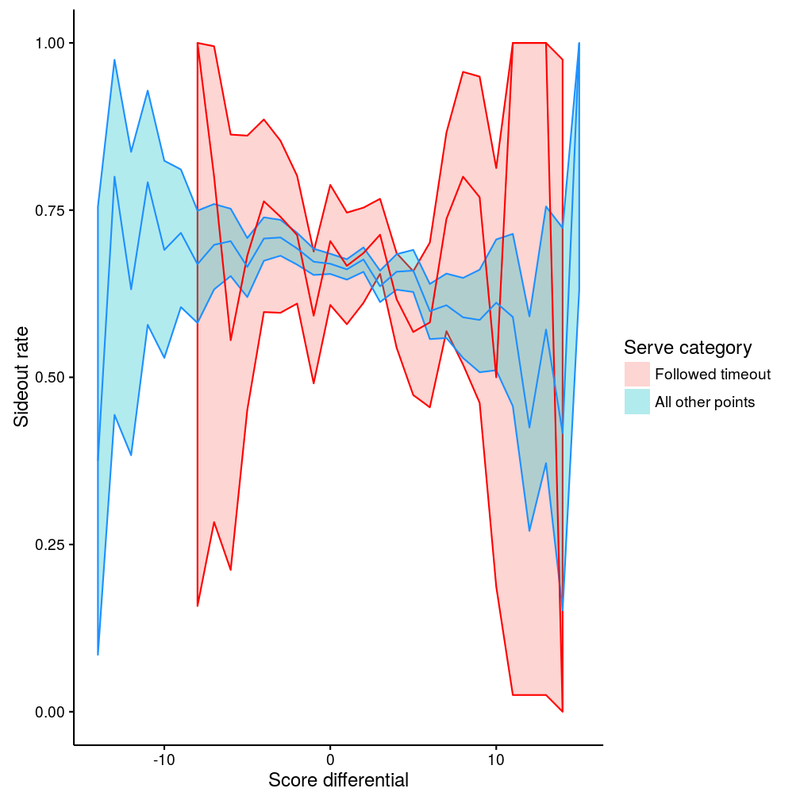 Perfect passes appear to be less frequent during general play than other serve categories, particularly after timeouts and the first serve of a set. 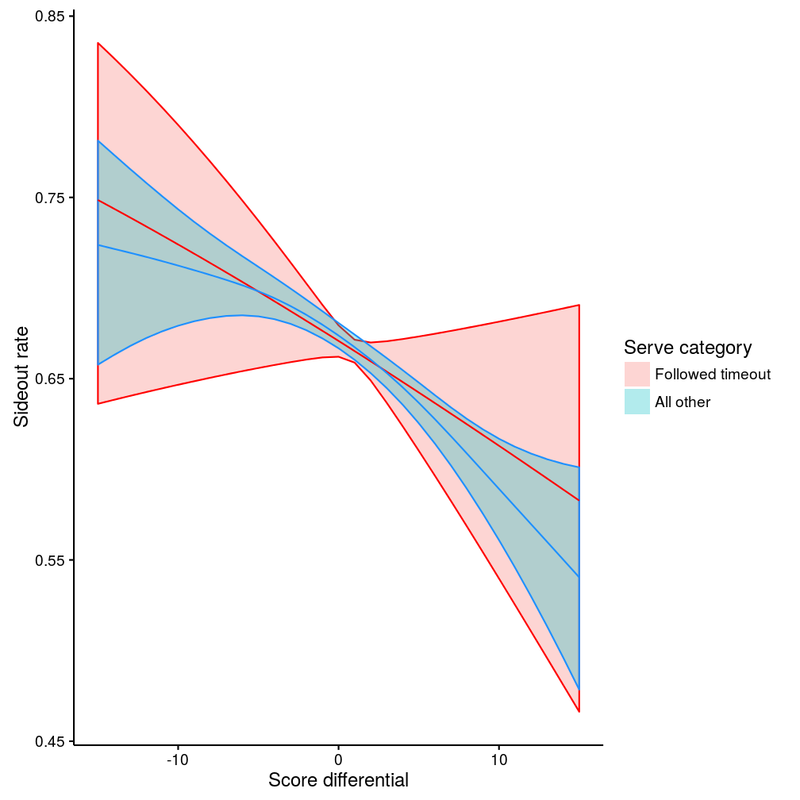 There is very little evidence for differences in sideout rate across the serve categories. The differences are larger than with standard sideout rate, but are still relatively small and the model that includes serve_category is not a significantly better fit to the data than the model without it. Nevertheless, earned sideout rates might be marginally lower in general play than the other three categories. This is consistent with the higher serve error rate observed during general play than the other three categories. As with earned sideout rate, the differences do not quite reach significance. Nevertheless, first ball sideout rates might be lower in general play than the other three categories. 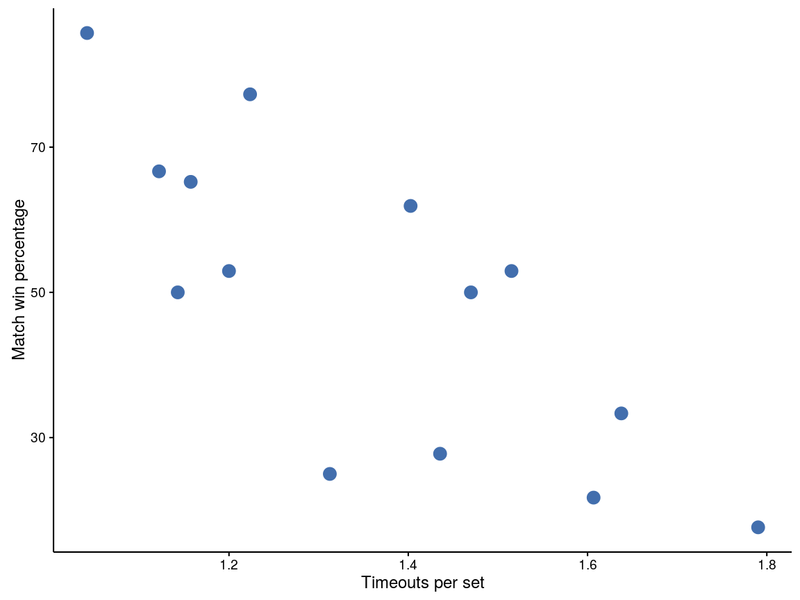 The results suggest that jump serves are less commonly used after technical timeouts. Bear in mind that the starting rotation of each team is relatively consistent from set to set, so the jump serve rate for the first serve of a set is probably most strongly determined by the players starting in position 1 (and whether they prefer jump-serving or not, rather than any psychological or other effect of being the first serve of the set). During non-timeout points (blue line), there is a clear relationship between sideout rate and score differential, such that sideout rate is higher when the serving team is behind, and sideout rate is lower when the serving team is ahead (exactly as one would expect). The relationship after timeout is not quite so clear. For relatively small score differential (say, -5 to +5 points difference) the timeout line (red) looks largely like the blue line. 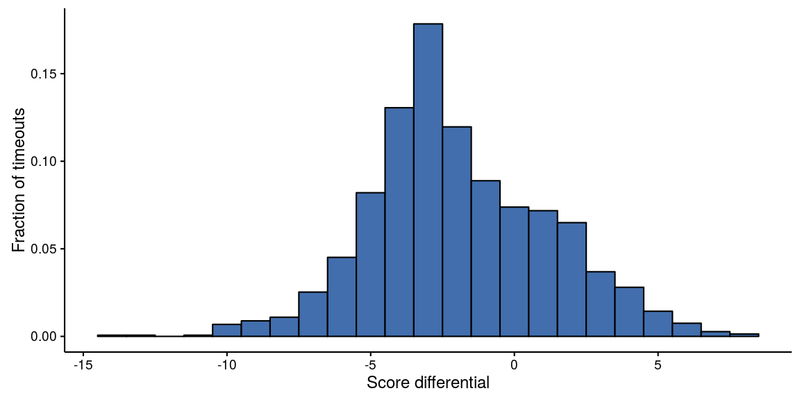 At more extreme score differentials (below -5 or above +5) the data are less consistent and the confidence intervals much wider, indicating that there isn’t sufficient data to draw strong conclusions. 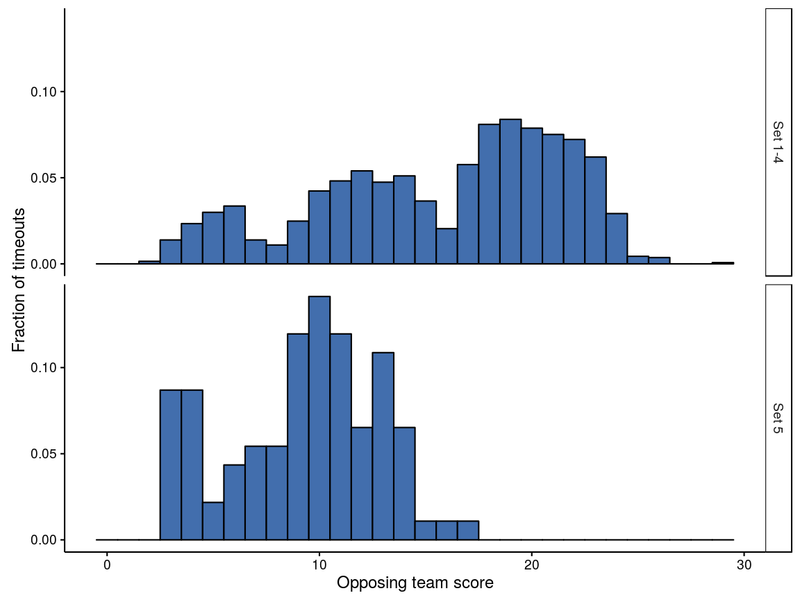 Overall, though, the confidence intervals overlap and so there is little to support the idea that the relationship between sideout rate and score differential is affected by timeouts. There is some variability in serve error rate depending on the run position, but overall run_position is not significant (that is, the model that includes uses a run position term to explain serve error does not fit the data any better than a model without this term). The run_position term is significant in this model, suggesting that the sideout rate falls during a serve run. That is, once I have reached the third serve of a run, I am actually slightly more likely to win the point (and hence continue the run) than would normally be the case. Note that the error rate estimates here (for run position 1–5) are slightly different than in the previous model — because now we are additionally accounting for the effect of timeouts. 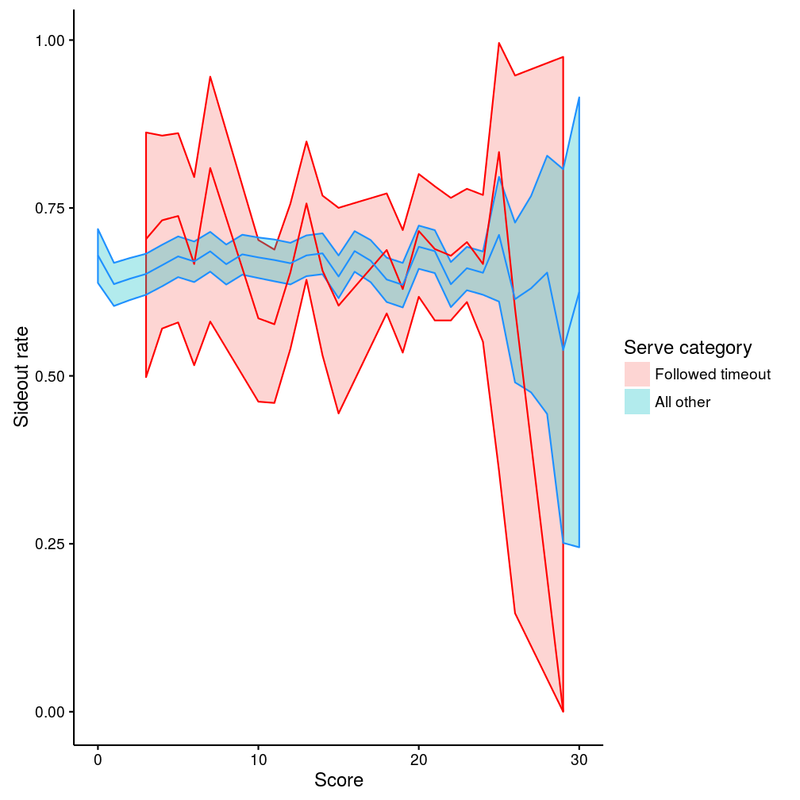 Serves following timeouts have a significantly lower error rate, just as we found previously. Although the fitted sideout rates are marginally higher after timeout, the uncertainty around this effect is large (hence the timeout effect is not significant — the model isn’t certain that this effect is not zero). We can’t conclude, given the data available, that sideout rate is affected by timeout. The test indicates that the second model does not provide a significantly better fit to the data — or in other words, that there is no particular evidence in this data that timeouts affect serve error rate differently depending on the run position of the serve. The data don’t support the idea that timeouts have a different effect (on sideout rate this time) depending on where in the serve run they are called. Rarely. There were 1407 serve runs in which at least one timeout was called. Two timeouts were called in only 53 of these. Posted on Saturday July, 16 2016 at 09:34:00 .